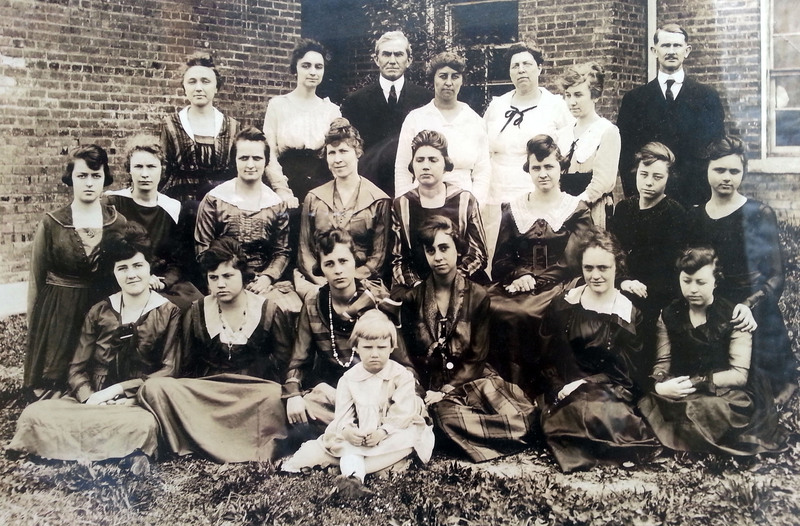 Class of 1919: (Front Row) Mary Cooper, Elaine Moose, Martha Dreher, Marie Dreher, Rosa James, Nancy Y. Smith. (Second Row) ?, Amy Fisher, Viva Euliss, Fannie Corriher, Emma G. Heilig, ? Mary Lowder, Queen Graeber. (Back Row) Natalie Rugheimer, Lorene Brown, Rev. J. H. C. Fisher, Miss Bulla, Miss Ella B. Shirey, Helen Misenheimer, Rev. Goodman.